It's a daunting task to watch a Cults' performance as it unfolds. A sea of screens projecting otherworldly static assaults your brain stem, inevitably seeping in to your unconscious mind. Is it a coincidence Madeline Follin and Brian Oblivion have utilized the indoctrination tactics so often used by other charismatic "leaders"? For Cults, it's all in the name of art. "We approach the band as more of an art project," explains Oblivion. "So many bands think that because they're not playing a big arena that they shouldn't try to bring an extra element to their show." That means dragging a lot of heavy equipment around with them, sacrificing life and limb for the cause. "I've dropped a lot of heavy things on my foot over this tour," Oblivion winces. "Really big cases but it's a real luxury to be able to think about how you’re going to present your show. Everybody thought we were crazy but I really wanted to make this to happen." Like a true visionary, Oblivion has his every move charted. As skilled organizationally as he is with a sampler, he knows it's nearly impossible for those ideas to materialize without planning. "We tend to be methodical because we are conceptual first. For "Static" we had an idea in mind for what we wanted it to be called, for what we wanted the artwork to look like before we even started writing songs. We find it helpful to have limitations and work within a specific ceiling so we don't go off the rails." Limitations certainly do not seem to be a roadblock for Follin and Oblivion as their sophomore effort pushes the band well past their established comfort zone. Static relies less on the big reverbs that they became addicted to, an intervention that was of course, self-imposed. "We wanted to push things and create a full sound in a more authentic way," Oblivion explains. "We wanted to use white noise and distortion. We wanted to come up with the kind of sound you would hear coming out of some abandoned, broken television set." As Oblivion spent his college years studying filmmaking at NYU, it should come as no surprise that the conversation veers its way back to the visual. "I love the word 'Static' because it is so visual. The way the word feels is important. It translates in to so many different meanings for me over time. The first way I looked at it was like the title of a '70s trashy b-movie horror flick. I like the action of the word, like how it's inflammatory and brings to mind so many associations." The confidence Oblivion shows is echoed by the support he's received from his record company, Columbia Records. In turn, he graciously returns that respect. "They're great. They've always respected our vision and our decisions. They didn't even hear the record until we showed up and played it for them. They never bugged us for demos. We just squirrelled off and did it on our own. It was a really smooth process." 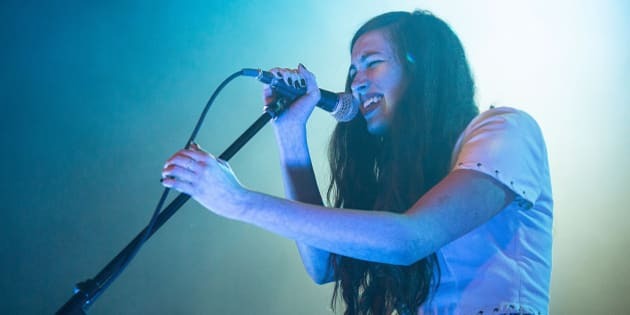 After some short-lived downtime, the Cults head back out on the road in January with their heroes, The Pixies. "They have been my favourite band for as long as I can remember," he says fondly. "The lead riff from "Where Is My Mind?' [off the band's debut, "Surfer Rosa"] is the first riff I ever learned how to play. It's pretty cool that it's looped around now and we get to perform with them." Where Cults fits in that never-ending loop remains to be seen but Oblivion certainly hopes that their band can weave its way in to someone’s psyche. "Whenever I think about music, I get emotional. I think about being a teenager, going to shows and listening to records. It changed my life. It drives how I relate to people. It's motivating to know that people believe in us and want to hear the music that we make. To have the possibility to be a small part of that for some teenager is a good way to judge if you're still on course."